Movarth Piquine is a hostile vampire found inhabiting Movarth's Lair. According to the Jarl of Hjaalmarch, he was once long-thought to be dead, though events uncovered by the Dragonborn during the quest Laid to Rest reveal that not only was he still alive, he was also actively hatching a nefarious plot that could ensnare the whole town of Morthal. Movarth is known as a dangerous master vampire, and will in fact prove to be a considerable challenge when fighting him. An anonymously written book contains the backstory of Movarth Piquine. Movarth used to be a Trainer at the Fighters Guild, as well as a successful vampire hunter, driven to uncover more about the shady abominations. 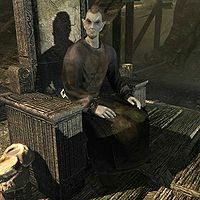 With the help and advice from an unnamed priest, Movarth would embark on quests around Tamriel, his efforts at exterminating them no doubt furthered by the insistent queries he made to the priest. However, his unbound curiosity on vampirism would eventually be the factor that brought about his downfall and subsequent transformation into a vampire. Movarth attacks with both Shock and Frost spells, and also displays skillful use of one-handed swords. 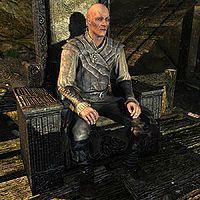 At his highest level he is very powerful and can make short work of even Dremora lords, and is capable of healing himself rapidly with his powerful life drain. Movarth is featured in the book Immortal Blood. Despite being described as an unarmed fighter in Immortal Blood, he prefers one-handed weapons. For historical information on Movarth, see the lore article. With Dawnguard, his race is no longer randomly assigned; he will now always appear as a Nord of a Dremora class. When the cave respawns, Movarth isn't replaced by a random enemy. Instead, he respawns as well. This page was last modified on 6 September 2018, at 03:39.